#20 – Coup – What's Eric Playing? October 25, 2015 November 19, 2016 • What's Eric Playing? Yup. I took a week off. My bad. Oh, Coup. With the recent unveiling of Coup Rebellion G54 it’s possible that some people are going to retire their original sets of Coup in favor of the new version. Should they? Let’s find out. So, I never really bothered with Coup / Resistance / One Night Revolution / etc lore, but I think I remember reading on the box that something was happening and someone took power and now power is split among factions that each player influences and you can occasionally “take people out” or something. Like most other games in, uh, “The Dystopian Universe”, the lore isn’t super important but it colors the gameplay somewhat. Basically, you have some power but you want more power, and the only people standing in your way are other players. You need to leverage your ever-changing influence to force them out of town so that you alone control … whatever the name of the place this game takes place in is. Cloudbank? Tempest? Sure, it’s probably one of those. This is a lot of unhelpful and apocryphal exposition. There are also a bunch of coins. Deal each player two (keep them face-down) and then set the remainder aside as the court deck. Please note that 7+ players will drastically increase the play time of the game, as it will take longer for rounds to end. This makes players less keen on getting eliminated, so they’re less likely to take risks, etc. Vicious cycle. Try to keep it to 3 – 6 players. Give every player two coins. 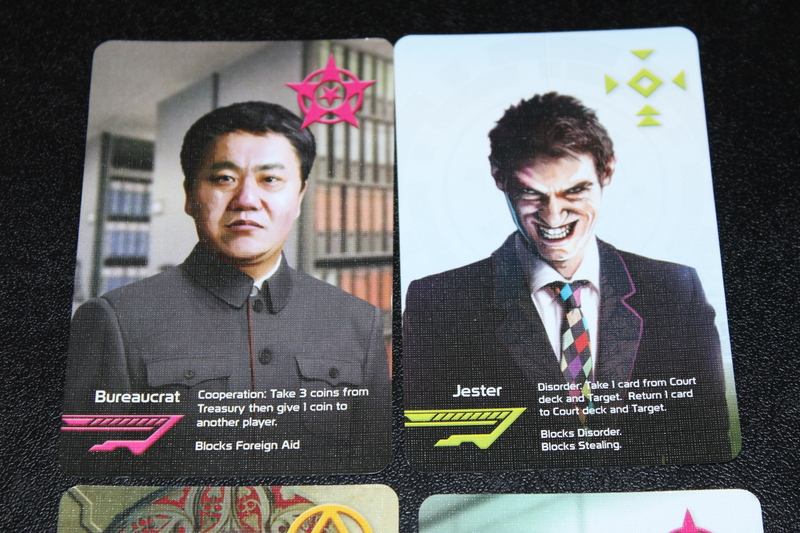 If you choose to play with only two players, split the deck into three sets of the five role cards. 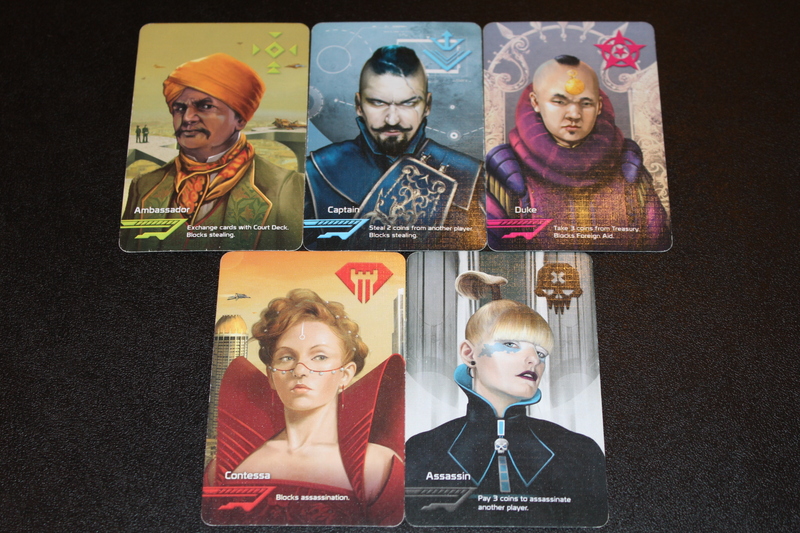 Each player gets one set of five, chooses a role, and puts the other four cards aside. Then, shuffle the remaining five cards and deal each player one. Again, keep your cards face-down. Give every player one coin, rather than two. Like I said, simple setup. Let’s talk Gameplay. Alright, so, by now you’ve probably read the cards and are legitimately confused, so let’s talk you through what’s going on. In Coup, you have two cards in front of you. These are people you influence, or, essentially, the two roles you have. Each role has different abilities. On your turn, you can choose any one action to perform (from a variety of actions I’ll list shortly), but that potentially can be blocked by an opponent’s counteraction. If your action gets blocked, your turn ends. There are three actions that do not depend on a specific role, and those are Income, Foreign Aid, and Coup. Income allows you to take one coin from the Treasury. This cannot be blocked. Foreign Aid allows you to take two coins from the Treasury. This can be blocked. 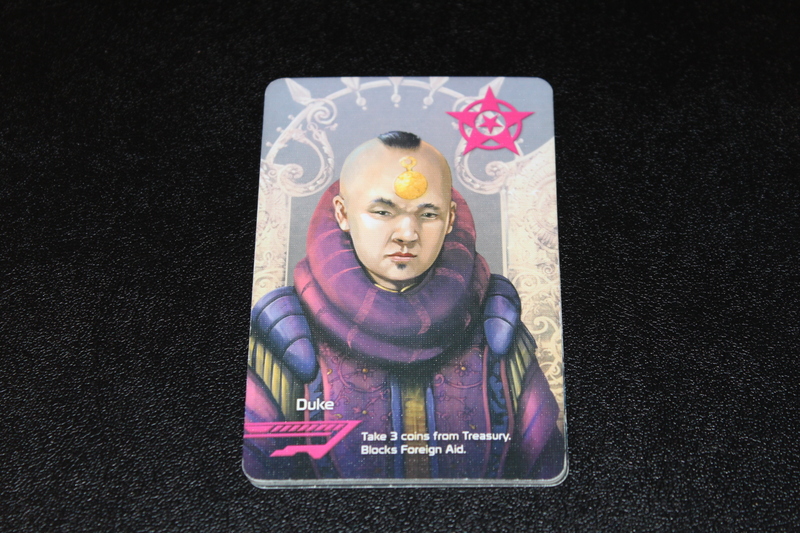 Coup allows you to pay seven coins to the Treasury to force a player to lose one influence (flipping that card face-up and being unable to claim its abilities for the rest of the game). This cannot be blocked. 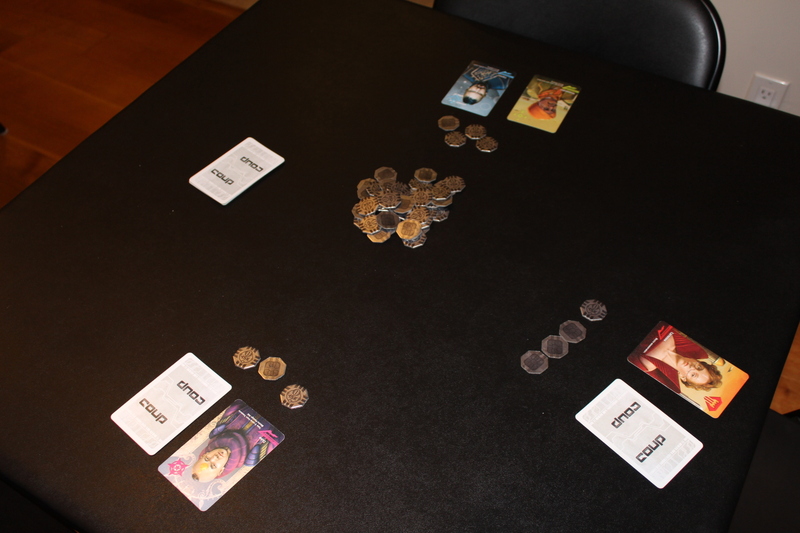 Also, if you ever have ten or more coins at the start of your turn, you must perform the Coup action. You do not get to do anything else. That’ll teach you to hoard your cash like some sort of crappy dragon. Please note if you lose both your influence cards, you are out of the game. This is unfortunate, so try to avoid it. If you lose, you have in fact, not won. Just an FYI. Anyways. Let’s talk about the other role cards. Oh, the Duke. The wealth in this town, not only is he interested in money but he’s also trying to block people who don’t have money from getting more. Your favorite trickle-down economics jokes aside, this is a pretty powerful role. On your turn, if you claim to be the Duke, you can take three coins from the Treasury. On someone else’s turn, if they try to take Foreign Aid, you can claim Duke and block them. That’s a bummer for them, usually. The Captain realizes that getting rich yourself is difficult. But stealing from the rich? That’s a bit easier. On someone else’s turn, if they try to steal money from you as the Captain, you can claim Captain and block them. Honor among thieves, y’know. The Ambassador is an interesting fellow. His goal seems to be helping set you up with the right people when you need them. 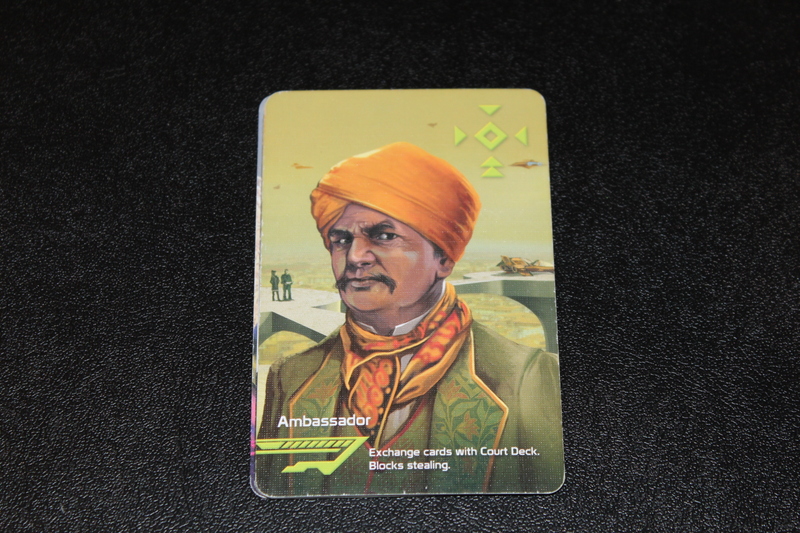 On your turn, if you claim to be the Ambassador, you can exchange cards with the deck. This means you draw two cards and, from those two cards and your role cards, you put two cards back and shuffle the deck. Note if you’ve lost an influence already, you can only keep one card. Sad, but fair. The lost influence is just stuck there forever. On someone else’s turn, if they try to steal money from you as the Captain, you can claim Ambassador and block them. I think this is mostly to buff the Ambassador, as otherwise it’d be a bit weaker than the other cards. The shadowy Assassin thinks that launching Coups is a bit too expensive for their blood, so they’re willing to help you take out who you need to take out, but for less money. That’s really nice of them! Murder on a budget. On your turn, if you claim to be the Assassin, you can assassinate any player you choose. You do so by paying three coins to the bank and then designating a player as your target. They then immediately lose one influence. This can be blocked (by Contessa). On someone else’s turn, the Assassin provides you no benefit. You got what you paid for. The Contessa has a pretty great security detail, and that’s apparently all there is to say on the matter. 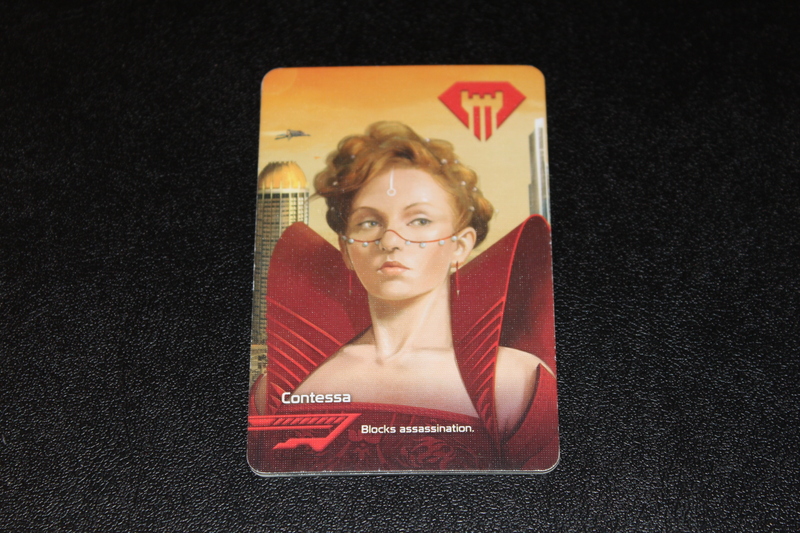 On your turn, you cannot claim to be the Contessa. She provides no action. Welp. 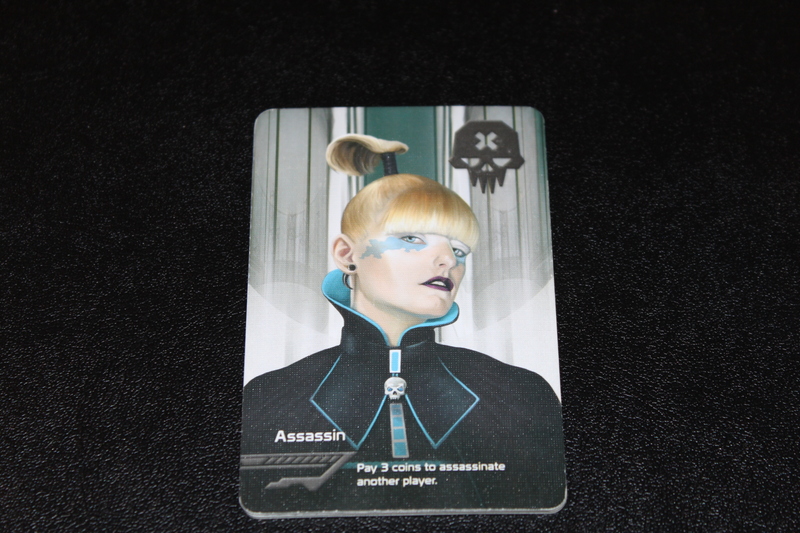 On someone else’s turn, if they try to assassinate you as the Assassin, you can claim Contessa and block them. Not dying is pretty great. That’s included with most games, I believe. I never really know what’s Kickstarter-version-exclusive or not. However, there’s an important part of the game that I’ve neglected to mention until now. As you might have noticed from some specific wording, you may have two roles face-down in front of you, but you don’t have to claim to be those roles. Just like your parents told you, you can be anything you set your mind to being. That being said, lying is a dangerous art. If another player thinks you’re full of it, they can challenge you. Any character action claim can be challenged, even counteractions; you just can’t challenge Income, Foreign Aid, or Coup. Additionally, you can challenge players in an interaction that you weren’t part of. Say Player A steals from Player B, claiming to be the Captain. You, Player C, can call A’s bluff, if you want (can’t really recommend). Only one player may issue a challenge, however. Resolve disputes however you want, but I’d say the person affected by the action usually has priority. What happens when someone is challenged? Well, they must reveal the card relating to the challenge. Say you claim Captain and someone challenges you. 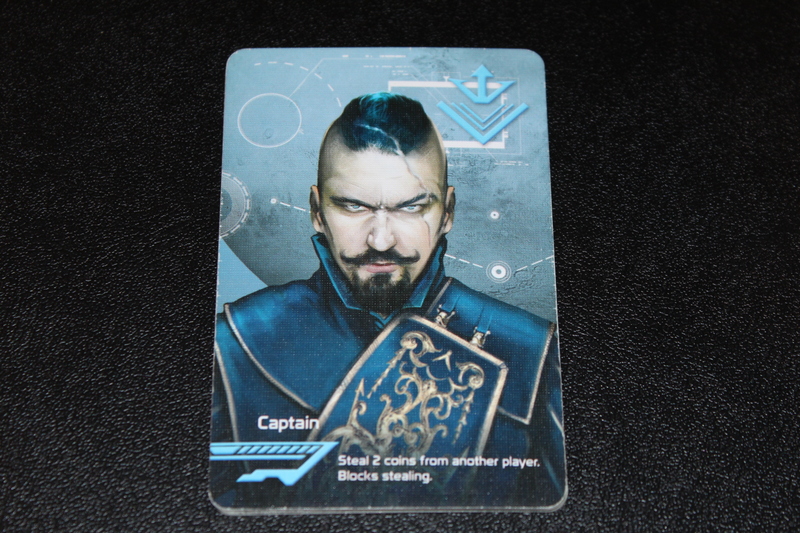 You must either reveal that one of your two face-down cards is a Captain, or you lose an influence. If you do reveal a Captain, the person challenging you loses one influence, and you shuffle your revealed Captain into the deck and draw a new card. Note that this means you might draw back the same Captain. That’s part of the game. Also note that bad challenges can be very costly. Say if someone Assassinates you and you claim that they’re not the Assassin. They reveal and they are the Assassin. This means you automatically lose one influence from the challenge, and then you lose another from being assassinated, causing you to lose the game instantly. This is commonly referred to as a bummer. So bluff and challenge carefully! Sometimes you don’t even need to bluff. However, sometimes, you DO. This is a terrible starting hand. The game ends when everyone except for one player is eliminated. Hooray! Let’s talk strategy. As with most deduction / bluffing games, this is pretty subjective. Having two of the same role is usually not great. For the most part, it cuts down on the diversity of things you can do without having to lie / risking a challenge. However, if you get challenged and win, you can claim the same role next turn and potentially trick someone into challenging you again. Your call. Double Contessas is a terrible, awful hand though. Use the Ambassador to see what cards are in the deck. This tells you what cards other people DON’T have. For instance, if you have Ambassador and Duke, and you Ambassador and draw two Dukes (somewhat unlucky), you know that nobody else has a Duke. This is really useful information! You don’t always have to block an action if you have the ability to do so. This is actually a great way to get someone to challenge you. Allow one person to take Foreign Aid when you’re the Duke and then block the next person. The frustrated second person will occasionally challenge you, and then they’ve lost one influence. Great! You also don’t always need to Coup once you hit seven coins. A lot of times, people wait and take an extra few coins to try and hit 12 or so (again note that you must Coup if you start with 10 coins, so this can only be done if you have 8 or 9 coins when your turn starts). This means they’re a lot closer to a second Coup after the first one. Also, not aggravating other players is occasionally nice. Sometimes this means you can manipulate them into helping you. You might see everyone claim Duke for the first couple turns. Just roll with it. This depends on your play group, though. Some people hate lying while playing Coup. Weird. Try to keep everyone’s influence count even. If you’re playing 1-on-1 and the other player has two influence and you have one, you’re probably going to lose. I’ve seen people still win (depends a lot on who has what money), but for the most part that’s a tough break. This usually means that it’s better to go after the person with the most influence when it’s time to Coup, not the person who just Couped you. If you’re looking for someone to eliminate, usually it’s good to go after the person with the most money. Otherwise they’ll probably go after you as soon as they get the chance. Quick. Most rounds only take like 15 minutes, tops. Eliminated players don’t have to sit out that long before they get back in, and that makes it such that player elimination isn’t a con for me, here. This also is great for people who don’t care for Avalon; it’s not a prolonged bluffing game, it’s short microbluffs. Easy to learn. 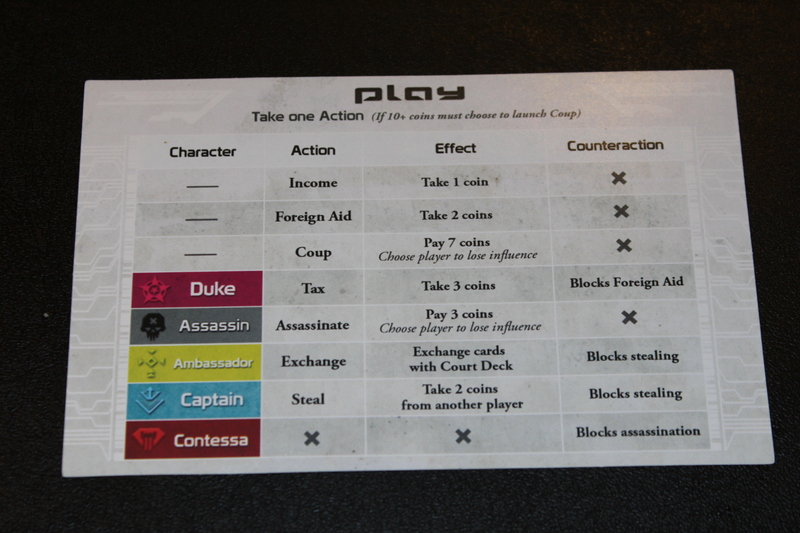 All available actions can fit on a tiny sheet of paper, and usually people get it after their first couple games. Cool art. 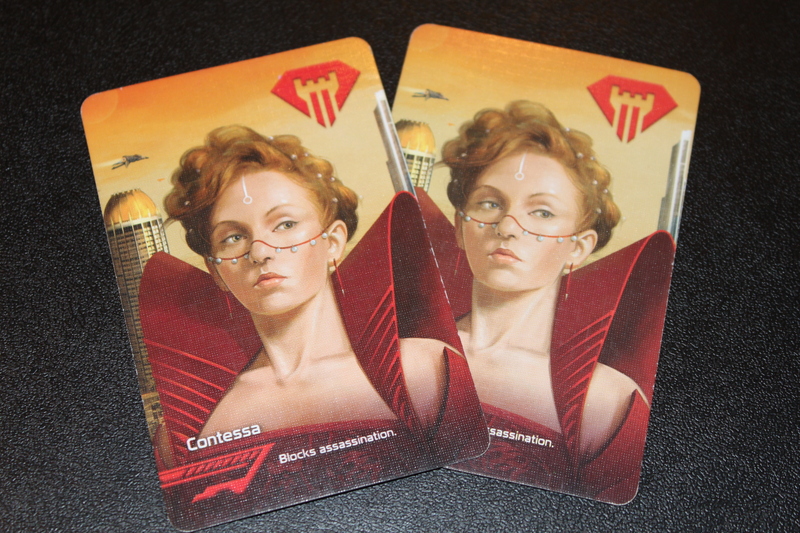 Especially if you got the Kickstarter versions (with a ton of alternate art) the Coup art is really, really nice. Also, the different colors for each role really cause the cards to pop. Simple. At its core, it’s essentially a fancier form of the card game BS, but with a slightly more graceful endgame condition. Rewards petty revenge. Did someone eliminate you last round? Coup them this round. It’s a great game for that, similar to the Lost Legacy series. A bit chaotic. But in a good way! Can have some fun variations. Speed Coup (5 – 10 seconds for your turn otherwise you lose an influence) is pretty great, but there’s also Blind Coup (don’t look at your cards), which I usually play without telling anyone that I’m playing. It’s pretty fun and I’d recommend it. It also helps prevent people from reading you if you worry that you’re a bad liar. Cards seem to not be made of the strongest stuff. 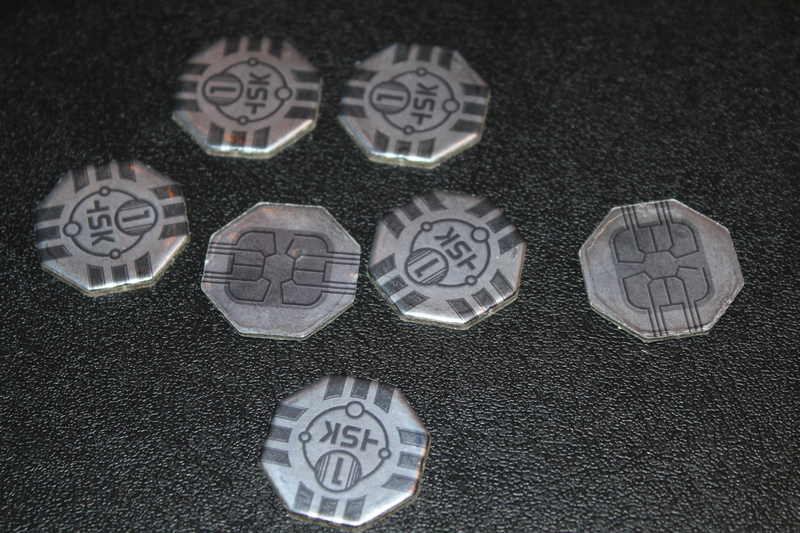 It’s unclear if I’ve just played a lot of Coup, but there’s definitely some visible wear and tear on the cards. I should probably sleeve them. Does not play well with more than six, in my opinion. Part of the appeal of Coup is that it’s pretty fast, and if you’re playing with 6+ (as some versions will let you do) you will notice slower games. Since there are more players, games take longer to end, and since games take longer to end, players are more likely to try to play conservatively (since they don’t want to be eliminated), causing the games to go longer. This is similar to Spyfall with < 5 or Avalon with 5 or Dominion with 5+. Can definitely be overthought. People get weirdly apprehensive about losing such a short game, so they might spend too much time on their turn thinking about their actions. Speed Coup usually fixes this, as mentioned earlier (you must take an action in 5-10 seconds or you lose one influence). Sort of degenerates when only two players are left. There are really only so many 1-on-1 matchups, role-wise, and each one has a clear winner. The ones that are balanced then just depend on who has more money or more influence. At a certain point you’re effectively forced to challenge the other player, because otherwise you’ll lose when they Coup / Assassinate you. This is a bit of a bummer. I don’t think I’m done with Coup yet. We have a bunch of microgames that my group plays (usually Lost Legacy or Hanabi), but this is a nice little bluffing minigame. While I think that Coup Rebellion G54 is much more robust (25 roles, compared to 5! ), I think that Coup is still gonna have a pretty solid place in my library. For one thing, I don’t think the roles in G54 are the same as Coup in all cases, and Coup has different counteraction mechanics than G54, in that roles can block other roles (G54 only allows a role to be blocked by itself). I’m pretty excited about playing with them, more. 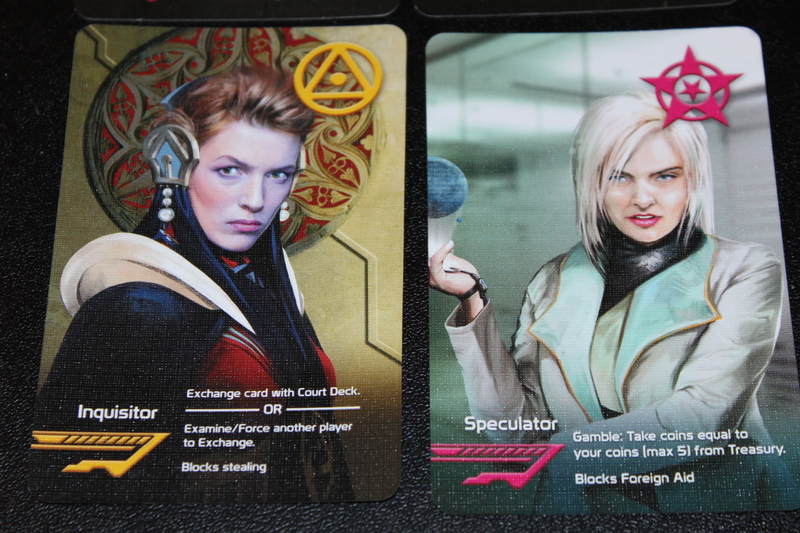 I’ve only played with Inquisitor so far (and I’ll likely save my thoughts on that for the Reformation review, when I get to it), but the others look pretty interesting, especially considering that you have to give all your coins to the challenger if someone correctly challenges your claim of Speculator. That seems aggressive. Jester just seems fun. That being said, I’m definitely the Duke. Trust me. Posted in reviewTagged bluffing games, board game, board games, card game, card games, competitive, competitive game, indie boards and cards, kickstarter games, tabletopBookmark the permalink.